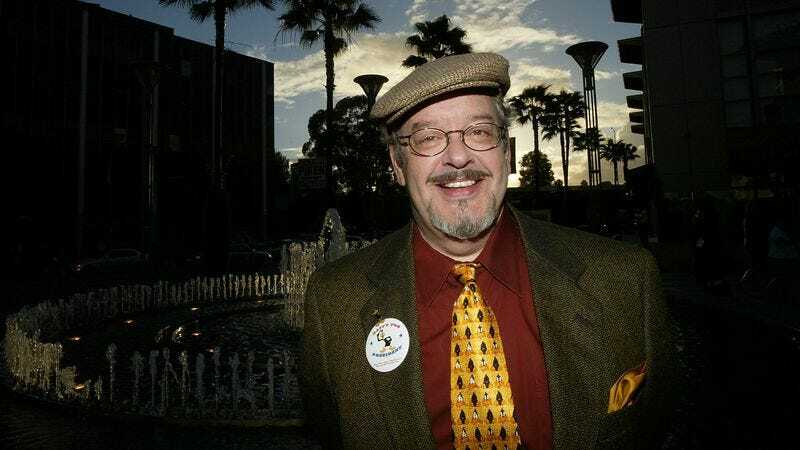 Actor Joe Alaskey, who died on Wednesday at the age of 63, was best known for his voice work in film and television, playing memorable roles like the irrepressible Plucky Duck on Tiny Toon Adventures and The Plucky Duck Show, and even inheriting, for a time, the roles of Bugs Bunny and Daffy Duck in such latter-day productions as 2003’s Looney Tunes: Back In Action. But before he got into cartoons in the mid- to late 1980s, scoring the roles of Yosemite Sam and Foghorn Leghorn in Who Framed Roger Rabbit?, the New York-born Alaskey was a stand-up comic, impressionist, and character actor. He also had a recurring role on the live-action sitcom Out Of This World from 1987 to 1991. Many impressionists have “signature characters,” like Rich Little’s Johnny Carson or Frank Caliendo’s John Madden. While Alaskey’s repertoire included Woody Allen, Don Knotts, William Shatner, and others, his specialty was Honeymooners star Jackie Gleason. Alaskey physically resembled Gleason, and his portrayal of “The Great One” is not so much a mere imitation as it is a full-body possession. So accurate was the impression that Gleason himself selected Alaskey to dub Ralph Kramden’s dialogue in the so-called “lost episodes” of The Honeymooners that were rediscovered and re-released in the 1980s. And in 1986, Alaskey was invited to do his act on Late Night With David Letterman. There, his set culminated with an argument between the characters of Kramden and Norton, playing both Gleason and co-star Art Carney and switching between the two voices effortlessly. Around 1992, as Fox was preparing to roll out The Plucky Duck Show, Alaskey talked about his career with reporter David Allan from Fox 23 in Albany, New York. In this clip, the actor discusses his celebrity impressions and his cartoon voices, so he gets the chance to do both Plucky Duck and Jackie Gleason in one segment. This clip is a special treat, as Alaskey discusses his big break in animation, being discovered by Bill Scott, the voice of Bullwinkle J. Moose. Scott recruited Alaskey to perform the role of Boris Badenov in some television commercials, and Alaskey does a few seconds of the gravelly, heavily accented Pottsylvanian spy as well.